Imagine this...one of the first movies I ever rated on IMDB just so happened to be Charlie and the Chocolate Factory. This movie happened to be one of only three movies that I have ever given a 1/10 rating (in case you were wondering, the other two were Losing Gemma and The Hottie and the Nottie). A movie has to be pretty special to get a 1/10, because I usually give all the really bad movies a 2/10 because I believe that they meant well, somehow. 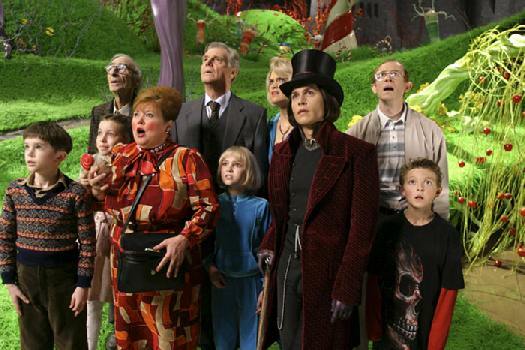 But Charlie and the Chocolate Factory? It's a movie I have always loathed. Johnny Depp. Meh. But he seriously looks scary in this movie, like he tried bleach his skin until it started glowing in the dark or something. Coz I loved the original so much. Tim Burton isn't a fantastic director...well anymore anyway. The oompa loompas were even more annoying than they should have been. The music annoyed me a lot. The original shouldn't have been remade in the first place. Too colourful...gave me a headache. Everybody else somehow likes this movie. IT'S JUST AN EPIC FAIL! Sorry if you really like this movie, but I really don't. It's soooooooo over rated.